Barry Miles’ William Burroughs biography ‘Call Me Burroughs’ is an extensive, fascinating biography of the ‘Naked Lunch’ author, including the William Tell shooting death of his wife and his life as countercultural spokesman. February 5, 2014, 9:38 a.m.
William S. Burroughs’ “Naked Lunch” stands with Jack Kerouac‘s “On the Road” and Allen Ginsburg’s “Howl” as the seminal texts of the Beat Generation. With its harrowing scenes of junkie depravity, its view of postwar America was the most extreme of all the Beats. Yet few American literary figures have enjoyed more second acts than Burroughs. He was spokesman for the countercultural movement in the ’70s, begrudgingly bore the label Godfather of Punk in the ’80s, and was a spoken-word performer and visual artist until his death in 1997. Barry Miles’ new biography, “Call Me Burroughs,” begins with the invention of the adding machine in 1888, which brought fortune to the Burroughs family and provided young master Bill a sizable allowance that he enjoyed until he was 50. Nice work if you can get it. Wealthy or not, the 20th century childhood of a sensitive gay man was rarely easy, but Burroughs was fortunate to have received his awakening early. Alert to their son’s sensitivities, his parents sent him to an experimental school in northern New Mexico where the great outdoors was as much a part of the curriculum as French, Latin and Greek. It was an all-boys school with an all-male staff that provided Bill with plenty of opportunities to confirm what he already knew about his sexual orientation. Getting caught resulted in immediate expulsion. Some semesters more teachers than students were sent home. The school was shut down when the government bought the land to build the Los Alamos National Laboratory, birthplace of the atom bomb. “It seemed to me right, somehow,” Burroughs quipped. “Call Me Burroughs” is riddled with stories like this: weird anecdotes laced with gallows humor, bizarre coincidences and profane punch lines. It’s a massive undertaking made complicated by Burroughs’ peripatetic lifestyle and rampant drug use. Although he benefited from family money, his allowance got him only so far. He dressed well, dined extravagantly, but he lived like a skid-row stewpot. It’s perhaps romantic to say that he rejected traditional systems of control — job, car, house, etc. — but Burroughs chose run-down hotels and apartments in dodgy neighborhoods to be close to the drugs he needed, and one can’t get more tied down than that. Burroughs and Ginsburg were lovers for seven years and remained close their entire lives. More than anyone else, Ginsburg helped Burroughs get his manuscripts into shape. Without Ginsburg, there would be no “Naked Lunch,” and without “Naked Lunch” Burroughs would be just another junkie who liked boys almost as much as he liked guns. The infamous William Tell incident, in which Burroughs shot his wife, Joan Vollmer, is the pink elephant in the room, and to Miles’ credit he doesn’t gloss over the incident. Burroughs was living in Mexico City trying to kick a heroin habit and regularly drinking to excess. Vollmer, whose Benzedrine habit had gotten her a stint in Bellevue, was taking a similar cure. Together they were a mess, and their approach to raising their two young children — Julie, Vollmer’s daughter from a previous relationship, and Billy, the boy they had together — could most charitably be called neglectful. During a drunken party Burroughs attempted to shoot a glass off Vollmer’s head and lodged a bullet in her temple. She died almost instantly. 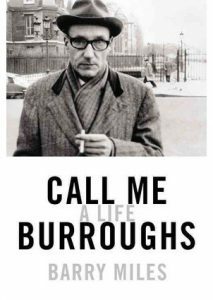 “Call Me Burroughs” presents a deeply flawed man who was icily indifferent to his family and a bona fide dangerous companion. Miles neither demonizes Burroughs nor excuses his lengthy catalog of vices. Yet for all his faults Burroughs remains strangely charismatic. His courteous mien, formal dress, laconic humor and hard-boiled bons mots made him a much-sought-after guest. He lived like a monk — if a junkie’s life can be characterized as monkish — but spent freely on his friends. When he finally settled down and bought a house in Kansas, he filled it with cats and then he wrote a book about them. His naive fascination with junk science, obsession with Scientology and devotion to his feline friends are difficult to reconcile with the pitiless progenitor of Dr. Benway, the Paregoric Kid and other aberrations of humanity that populate Burroughs’ novels. “I contain multitudes,” Walt Whitman famously exclaimed, and though Burroughs was the least Whitmanic of the Holy Trinity of Beats, Miles’ comprehensive biography explores all sides of Burroughs’ dark and complex personality. Ruland is the author of the short-story collection “Big Lonesome” and the host of the reading series Vermin on the Mount.